The EnGenius DuraFon 1x Long Range Industrial Cordless Phone System provides mobility and communication in demanding business environments including: nurseries, car and truck rental lots, self-storage facilities, farms, maintenance yards, marinas and other large campus environments. Six times as powerful as the average cordless phone (708mW peak RF output). More power and more range than any other phone that's legal to use in the US and Canada. 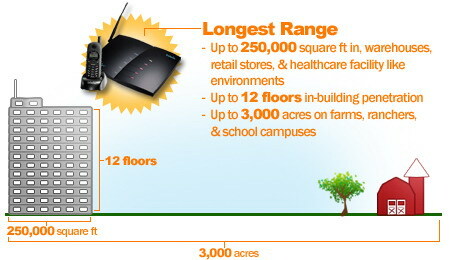 Range depends upon your local environment: typically 12 floors in building, 250,000 sq. ft. in a warehouse, and 3,000 acres on a farm, ranch, car lot or campus. You can connect one or even two external antennas for additional range and coverage area. Straight-line "open field" range has been tested at over five miles. Typical range is a mile or two. 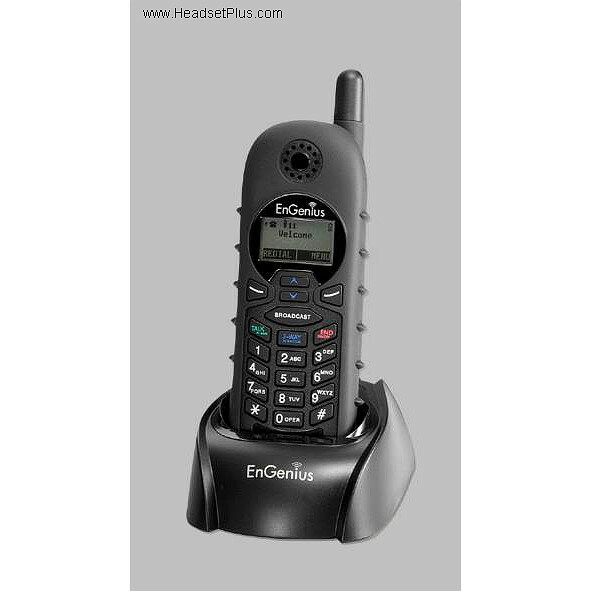 In addition to being a cordless telephone, the EnGenius DuraFon is also a full-duplex 2-way radio (walkie-talkie) which operates independently of the base unit. You can have up to 9 handsets per base. Single Line (1-ports / line per base unit). If you know you'll want more than one line, we recommend the 4-line DuraFon PRO . .
Damage resistant low profile antenna, plus longer handset antenna for longer range when needed. Handset sits in charging cradle that needs AC power, but no phone connection. You can put it anywhere you have power. Separate base connects to any ordinary analog phone line, or an analog port in a phone system. The base can be used horizontally or vertically, or mounted on a wall. Full duplex 2-way radio without using the base. Half duplex voice paging to one phone, several phones, all phones. Digital Spread Spectrum radio transmission with Frequency Hopping resists noise and provides extremely high resistance to eavesdropping. Frequency changes 100 times per second. Programmable PBX function soft key. Auto Attendant with call redirect assistance. Fast battery charging: just 90 minutes. You can keep an optional spare battery charging at all times. Hot swap: you can change batteries while a call is on hold, without losing the call. Up to 50 hours standby time. Any-key answering, redial, mute, hold and volume control. Store up to 30 names/numbers for quick speed dialing. Capable of answering any line if there is more than one base unit. Caller ID with Call Waiting. 3.5mm input jack for music- or message-on-hold. Optional external antenna for indoor use in warehouses and factories, or outdoor use on farms, ranches, campuses, car lots, etc. 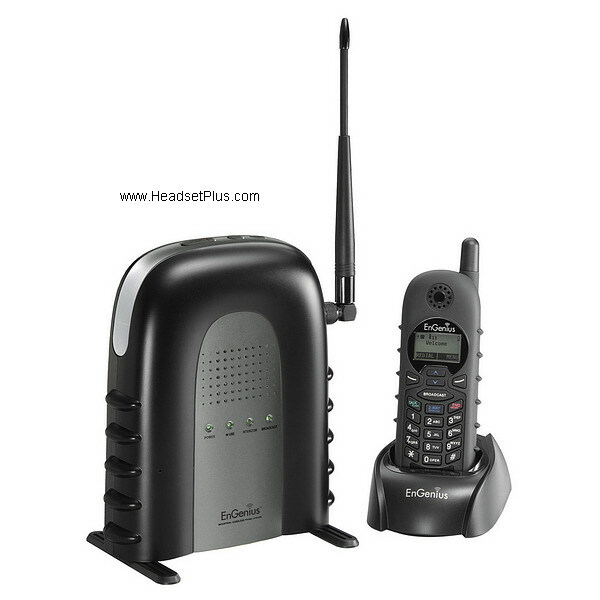 Handset weighs just 6.2 ounces, and measures 6.3 x 2.3 x 1.2 inches with short antenna. NOT compatible with earlier SN900 or SN920.